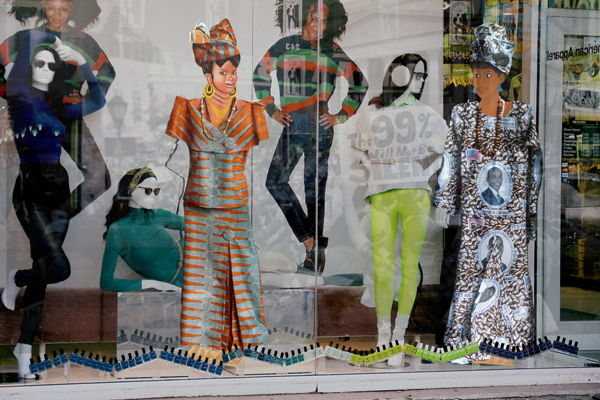 A collection of Nigerian-born artist Fatimah Tuggar’s unique, stylish, soulful works is currently on display at the University of Delaware (February 6 – May 12). In/Visible Seams’ features a montage of ink-jet prints on vinyl. It’s a montage so expect the unexected! It’s photography taken to an unexpected level. The colors are vivid. The scenes are inspiring. It’s imagery that spans the world, from Nigeria, to the United States, to many places in between. It’s fashion, funk, tradition, and mystique, we could go on, but you probably get the point. We’re sad we’re not going to get to see it up close and personal. Never one to go the way of trends, Fatimah marches to the beat of her own drum when it comes to her artwork, and the outcome is always enjoyable. She’s not one you can simply look past.